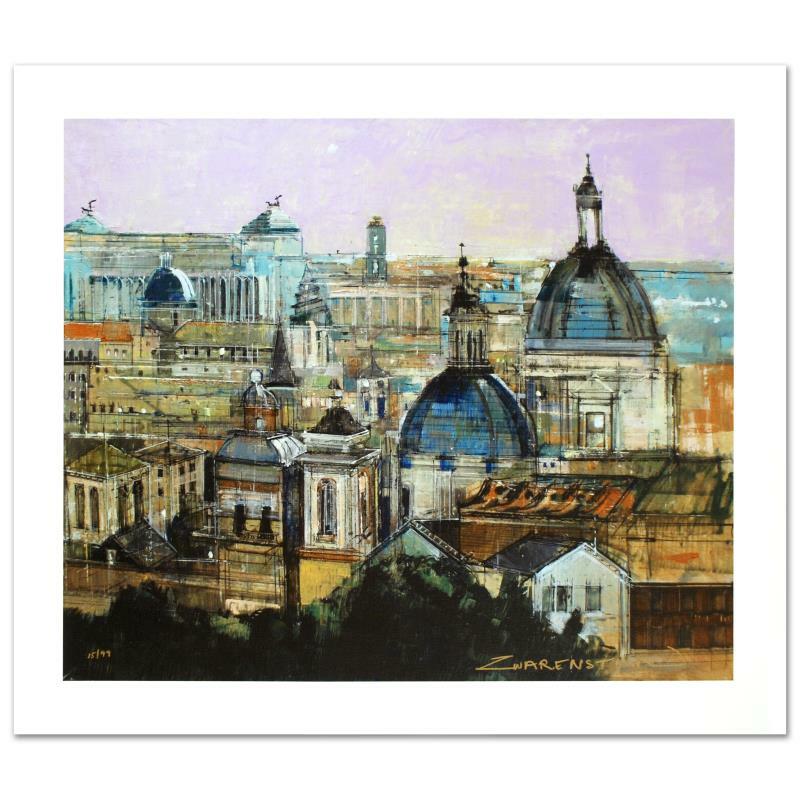 "Rome Rooftops" Limited Edition Giclee on Canvas by Alex Zwarenstein, Numbered and Hand Signed with Certificate of Authenticity. "Rome Rooftops" is a limited edition giclee on canvas, numbered and hand signed by Alex Zwarenstein. Includes Certificate of Authenticity! Measures approx. 24" x 20" (image). Alex Zwarenstein was born in 1952 in Southern Rhodesia which is now Zimbabwe, and at 17 he left Africa in search to master his craft and studied in London at the Royal Academy of Art where he obtained his Master’s Degree in painting. 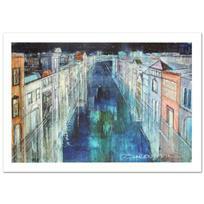 He has received many awards such as the Royal Academy of Art Gold Medal and the Turner Traveling Scholarship. He spent 10 years giving back to the art community by teaching at the Harrow College of Art in England, Fashion Institute of Technology in New York, the National Academy of Design, and the Art Students League. Zwarenstein’s work has been featured in National Geographic documentary “Water Towers of New York”, numerous magazines covers in the U.S and Europe; he also was a cover Illustrator for Forbes Magazine and the National Review. Alex had his first Solo Exhibition at the Eleanor Ettinger Gallery in New York in 1988 and has had successful exhibitions in the U.S., Europe, Africa, and Asia. "Jerusalem at Dusk" Limited Edition Giclee on Canvas by Alex Zwarenstein, Numbered and Hand Signed with Certificate of Authenticity. 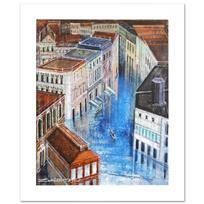 "Jewel Canal" Limited Edition Giclee on Canvas by Alex Zwarenstein, Numbered and Hand Signed with Certificate of Authenticity. 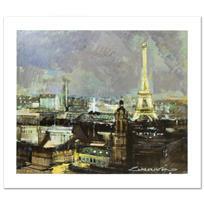 "Paris by Night" Limited Edition Giclee on Canvas by Alex Zwarenstein, Numbered and Hand Signed with Certificate of Authenticity. 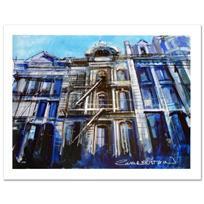 "Soho Iron Flats" Limited Edition Giclee on Canvas by Alex Zwarenstein, Numbered and Hand Signed with Certificate of Authenticity. 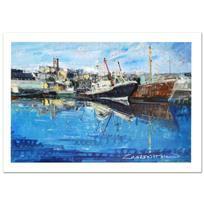 "Penzance Harbor" Limited Edition Giclee on Canvas (36" x 24") by Alex Zwarenstein, Numbered and Hand Signed with Certificate of Authenticity. "Long Canal, Venice" Limited Edition Giclee on Canvas (36" x 24") by Alex Zwarenstein, Numbered and Hand Signed with Certificate of Authenticity. 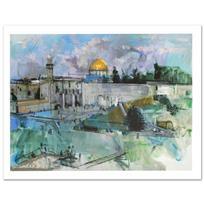 "Jerusalem" Limited Edition Giclee on Canvas (40" x 30") by Alex Zwarenstein, Numbered and Hand Signed with Certificate of Authenticity. 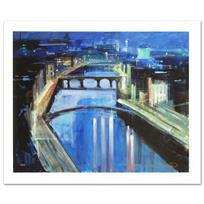 "Dublin by Night" Limited Edition Giclee on Canvas by Alex Zwarenstein, Numbered and Hand Signed with Certificate of Authenticity.